page is left in place for historical and reference purposes. The Amplidan model 50713 telegraph key is one of the classics. Used by ships' radio officers all over the world, the Amplidan key has a reputation like no other. Professional quality from stem to stern. They're also scarce-- Amplidan stopped making the keys 10 years ago and Morse Express has acquired all remaining keys from the factory. 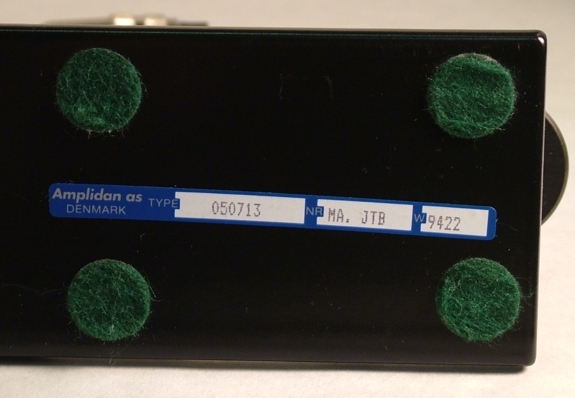 Amplidan keys were sold as part of marine communication systems, and as a component for other OEM's systems. Although the keys are no longer in production, repair parts are still available from Amplidan. 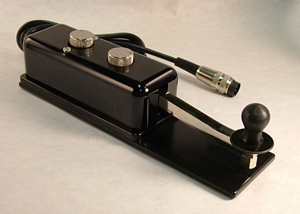 The key weighs 2.3 Lbs (1.1Kg) and the base measures 8-7/8" x 2-3/8" with overall height 2.25" to the top of the knob. Two large thumb screws provide for quick and precise adjustment of contact spacing and lever tension. The base is a steel plate and with that LONG lever this is one of the most stable keys around-- an absolute joy to use. Your fist will fall in love with it instantly, or we'll happily buy it back from you! If you are a user of the AMPLIDAN key, your comments could be here! Write to us via the link below, and please be sure to say specifically that we can use your comments on the web page. Amplidan is certainly the very best. have the Amplidan as part of my CW sending collection.